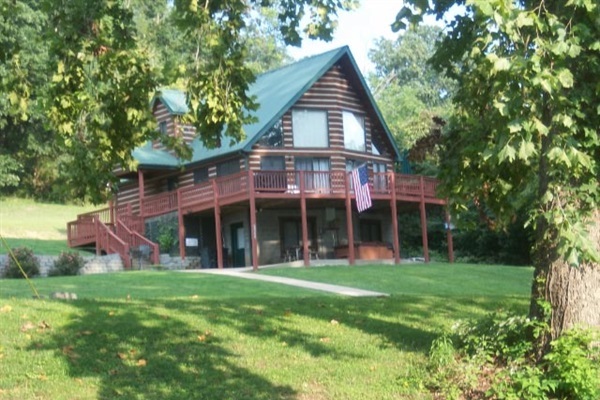 Papa Bear's River Cabin is nicely located along the Shenandoah River. This private rental cabin offers the guest a quiet and secluded place to enjoy their Shenandoah Valley Vacation. Here in the Shenandoah Valley many tourist find this a very popular vacation spot due to its seclusion and beauty. The Shenandoah Valley is surrounded by mountains, and beautiful ridges. The Blue Ridge Mountains and the Shenandoah River make for breath taking views of sunrises and sunsets. A photographers dream place ! Here at Papa Bear's River Cabin you can gaze at the stars, fish from our riverfront property hike along the property or just relax in our hot tub. Papa Bear's Riverfront log cabin rental property was carefully custom hand-crafted by its owners who operate a local saw mill in Shenandoah, Virginia. this cabin is located just South of Luray & Stanley Virginia and only minutes from the magnificent Luray Caverns. The rental cabin, located in Page County, Virginia, has three bedrooms, two full baths and sleeps eight people. Papa Bear's River vacation cabin has an open two story great room with a beautiful gas log fireplace. There is also a 6 person hot tub to relax in while watching and listening to the soothing sounds of nature. Papa Bear's Cabin would like to extend a warm welcome to you and hopes you will consider visiting his cabin real soon. $250.00 per night for up to 4 Guests. Extra Guests are $25.00 each per night. Occupancy shall not exceed number of guest stated on lease agreement. A 50% Deposit is required and your reservation will be confirmed with a credit card, money order, cash, cashier or personal checks accepted. Check Out : 11:00 A.M.
We must have a completed lease agreement and deposit before we confirm your reservation. Limited Time Offer : Book 6 nights or more and receive 15% Discount.